I mentioned in a previous post that I bought an inexpensive Flashpoint Studio 400 Monolight for use in my home studio along side my Elinchrom RX series monolights and my Nikon Speedlights. I didn’t hold much hope that I would be pleased with this purchase. This was kind of a “money is tight and what the heck” purchase. Well I’m here to report in non technical terms that I am completely shocked by the quality and value of this studio flash. First off build quality appears to be excellent, in fact better than my entry level Elinchrom D-Lite RX One which cost $100 more and much less powerful! 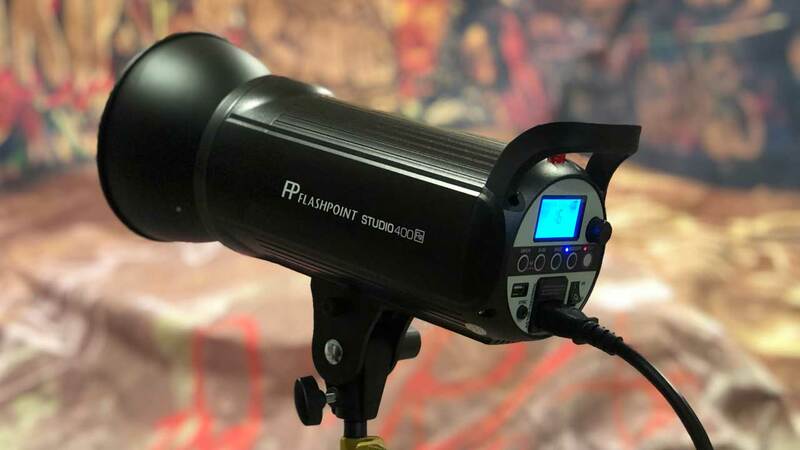 The Flashpoint Studio 400 features a Bowen “S” mount which translates into a wide variety of inexpensive reflectors, softboxes and other modifiers. The included 60 degree reflector is the most common reflector. Like any other flash the Flashpoint Studio 400 can be used with a sync cable, as a slave of with Flashpoint or Godox wireless trigger. The group and channel settings are completely intuitive. The unit has a proportional modeling lamp which means the output of the modeling lamp adjust as you adjust the output of the flash versus a single power level. . This is very helpful. Btw I have also used the modeling lamp as a tungsten light source for some dramatic effect. The Flashpoint Studio 400 is incredible easy to to use. If you have ever messed with Nikon speedlights you will appreciate the simplicity of this flash. The power level is set with a knob, the slave function and modeling lamp is set with the press of a button. I bought the Flashpoint Studio 400 Monolight to use a slave to my Elinchrom monolights. The control of my Elinchrom strobes is handled by a EL-Skyport Transmitter Pro for Nikon. The EL-Skyport transmitter transmits my setting to all the Elinchrom flashes while I manually set the Studio 400 slave. I actually prefer this because I’m using the Studio 400 for fills, lighting the backdrop or a hair light, and because the power level is adjustable by simply turning a knob I find it faster and faster and easier than diving through menus. I’m so pleased with this unit it has inspired me to set up a low cost portable flash system. More on that to come! Why You Might Like The Flashpoint Studio 400 Monolight! After spending time with this unit I came to the conclusion that from a cost and simplicity point of view the Flashpoint Studio 400 Monolight is a great way to get introduced to studio flashes. Add the Flashpoint R2 Transmitter and incorporate wireless triggering into your studio for a bargain price with tools that are easy to use. It’s so simple a caveman can do it. The Flashpoint Studio 400 and R2 Transmitter combined cost less than my Skyport EL Transmitter alone. Do it! This entry was posted in Flash and tagged Flashpoint, Godox by DSLRPRO. Bookmark the permalink.